This policy brief is one of five commissioned by the Department of Health and Human Services, Office of the Assistant Secretary for Planning and Evaluation on Medicaid eligibility policies for long-term care benefits. This brief presents the fundamentals of Medicaid liens -- what they are, why they are permitted, and how they are applied by state Medicaid programs. 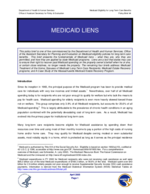 Liens are a tool that states may use to ensure their right to recover past Medicaid spending on the property owners behalf when he or she, or certain close relatives, no longer needs the property. The remaining four briefs address: Medicaid Treatment of the Home; Spouses of Medicaid Long-Term Care Recipients; Medicaid Estate Recovery programs; and A Case Study of the Massachusetts Medicaid Estate Recovery Program. Since its inception in 1965, the principal purpose of the Medicaid program has been to provide medical care for individuals with very low incomes and limited assets.1 Nevertheless, over half of all Medicaid spending today is for recipients who are not poor enough to qualify for welfare but who lack the means to pay for health care. Medicaid spending for elderly recipients is even more heavily skewed toward those not on welfare. This group comprises only 3.9% of all Medicaid recipients, but accounts for 25.6% of all Medicaid spending.2 This is largely attributable to the prevalence of chronic health conditions in an aging population combined with the potentially devastating cost of long-term care. As a result, Medicaid has evolved into the primary payer for institutional long-term care. Many long-term care recipients become eligible for Medicaid assistance by spending down their resources over time and using most of their monthly income to pay a portion of the high costs of nursing home and/or home care. They may qualify for Medicaid despite owning modest or even substantial assets, most notably equity in a home, which is protected as long as it serves as the principal residence of the recipient or certain close relatives. However, when this is no longer the case, Medicaid rules clearly envision using that equity to pay for long-term care -- whether prospectively by counting a former home as an available asset and denying Medicaid eligibility on that basis, or retrospectively by recouping Medicaid spending on behalf of a recipient at some time in the future. Medicaid liens protect Medicaids interest in the recipients former home and its right to recover Medicaid spending before the property can be conveyed to another party. Liens in themselves do not force recipients to sell their property. They may, however, prevent property from being given away or sold at less than fair market value and ensure that equity in the home is available to reduce Medicaid spending on the homeowners behalf. Considerable state-to-state variation in how liens are applied and how they fit within the broader context of the Medicaid estate recovery mandate has led to widespread misunderstanding and distrust. Beneficiaries and their families sometimes view liens and estate recovery actions by the State as tantamount to stealing inheritances and confiscating peoples homes. Other factors contributing to this negative view are: conflicting opinions about the legitimacy of Medicaid liens and their potential to offset future Medicaid budget cuts; anecdotal evidence of insensitive application of Medicaid liens and recoveries in some cases; concern that the threat of liens may discourage people from seeking the Medicaid help they genuinely need; and the absence of comprehensive, consistent data about how Medicaid liens really work. Medicaid liens on real property of deceased recipients have been permitted since the beginning of the Medicaid program. They have also been authorized in limited circumstances on real property of living recipients since 1982.3 Liens have recently attracted media attention and generated a great deal of concern as states have increased their use in response to the 1993 estate recovery mandate, enacted in the Omnibus Budget Reconciliation Act (OBRA 93).4 This legislation required states to recoup the costs of long-term care and related Medicaid services from the estates of certain deceased recipients (shown below). In the most general sense, a lien is the right to take someone elses property if an obligation is not discharged. It confers to the lien holder (creditor) an interest in the property that lasts until the property owners debt to the creditor is satisfied or otherwise released. The right to collect a lien and procedures for enforcing that right are established under state property laws, which prescribe circumstances under which creditors have the right to file a claim against any kind of property. There is also another narrower and more familiar meaning of the word lien that applies specifically to real property. It is secured in a manner that is roughly similar in all states and is analogous to the security interest of a mortgage holder. After the creditors lien is approved in accordance with state property law, it is recorded against the specific property with the local property office, usually called the Registry of Deeds. Title to the real property is thus encumbered and cannot be transferred without notifying the lien holder, who is then given an opportunity to file a claim. (Medicaid TEFRA liens, described below, are this type of lien). Creditors do not exercise or enforce their right to collect until they actually file a claim for payment of money owed. In concept, Medicaid liens are based on the presumption that equity in certain property belonging to Medicaid recipients should be used to defray the owners health care costs before the property can be transferred.7 A lien, defined in the most general sense, establishes the States right to make a claim against all real and personal property and other assets within the estate of Medicaid recipients after their death or the death of their spouse. Estate recovery law in some states (e.g., Rhode Island) says specifically that an individual applying for Medicaid who is 55 or older must be advised that: receipt of Medical Assistance may constitute a lien upon his or her estate.8 In its narrower definition, a lien is an encumbrance filed by the state Medicaid agency in land evidence records specifically against real estate property of living Medicaid recipients. Since passage of the Tax Equity and Fiscal Responsibility Act (TEFRA 1982), states have had the option to use liens to prevent Medicaid long-term care recipients from giving away assets -- specifically a home in which they no longer reside -- before they are used to offset long-term care expenses paid by Medicaid on their behalf.10 When states elect to use this option, the financial interests of Medicaid are given precedence over the interests of adult children or others who reside in or claim an interest in the homes of institutionalized Medicaid recipients who no longer live in them and may never do so again. TEFRA liens are the only type of lien that may be placed prior to the death of a Medicaid recipient whose benefits have been correctly paid. For this reason, they are also called pre-death liens. They only apply to permanently institutionalized individuals. While estate recovery does not begin until the Medicaid recipient dies, a TEFRA lien may be placed against the real property of a recipient of any age who is an inpatient of a nursing facility, intermediate care facility for the mentally retarded, or other medical institution, if it has been determined that he or she cannot reasonably be expected to return home. States must afford the individual an opportunity for a hearing on that finding and are required to dissolve a TEFRA lien if the Medicaid recipient returns home. Restrictions on the placement of TEFRA liens -- all aimed at protecting homes against Medicaid claims when they are needed by Medicaid recipients or certain close family members -- are shown below. The State must first find the recipient to be permanently institutionalized and afford him or her the opportunity for a hearing on that finding. The State must release the lien if the recipient is discharged and returns home. A spouse, child under 21, or blind or permanently disabled child of any age. A sibling with an equity interest in the home who has lawfully resided in the home for at least 1 year before the recipients admission to a medical institution. In effect, the imposition of a TEFRA lien presumes that any attempt to transfer property signals that the house is no longer the actual residence of the still living recipient. Its equity value is therefore considered to be available. A TEFRA lien does not interfere with the recipients use of the home. However, if Medicaid recipients who own property choose to transfer their house to someone else (whether by sale, gift, or other means), the State can oblige them to use that equity value to repay past Medicaid spending for long-term nursing home care and other services.11 Remaining equity, if any, may cause the persons assets to exceed Medicaid eligibility levels and, as a practical matter, may oblige the seller to use these funds to cover future long-term care costs out-of-pocket until the funds are depleted, an unwelcome financial consequence if the recipient or the family expected to receive the home or its sale proceeds free and clear. If the property is sold voluntarily, Medicaids claim must be settled first. Its priority relative to the claims of others, such as mortgage lien holders, is established in state law. The maximum amount Medicaid can collect is either the amount spent on the individuals behalf or the individuals equity interest based on the homes fair market value, whichever is less. The Medicaid recipient receives whatever amount, if any, is left of the sale proceeds. While a TEFRA lien does not force the long-term care recipient to sell the home, circumstances of individual cases can produce the same result. For example, the recipient may not have sufficient funds to pay property taxes, insurance, or other home-related expenses after spending most of his or her income to meet Medicaids monthly share-of-cost payments for long-term term care.12 If the individual sells the home, then the equity interest, based on the propertys fair market value and net sale proceeds, becomes a countable asset and triggers Medicaid recovery. If the home owner dies with a TEFRA lien still on the property, Medicaid recovery occurs as part of the estate settlement process. If the property is conferred as part of the recipients estate to someone without a protected interest in it (e.g., an adult child), the transferee must pay off Medicaids claim in order to receive a clear title to the property. Heirs who lack the means to pay Medicaids claim either obtain a loan or mortgage to keep the home in the family or sell the property to satisfy the Medicaid claim. Federal guidelines allow states broad flexibility in the design of their Medicaid estate recovery programs. At a minimum, they direct states to pursue recovery of assets conveyed through probate -- a legal process governed by state law and enforced through the probate court that settles wills or conveys property in the absence of a will.13 At a maximum, they give states the option to expand the definition of estate to include any or all assets outside of probate, defined by Federal law as any other real and personal property and other assets in which the individual had any legal title or interest at the time of death (to the extent of such interest), including such assets conveyed to a survivor, heir, or assignee of the deceased individual through joint tenancy, tenancy in common, survivorship, life estate, living trust, or other arrangement.14 Individual state property and probate laws determine how, when and if a state will assert its right to recover Medicaid expenses from non-probate assets under either definition of estate. States may file post-death liens against the real and personal property of persons who were permanently institutionalized and those who received Medicaid services after age 55, whether or not they were institutionalized. Post-death liens are often a part of the probate process. The laws of some states (e.g., California, Pennsylvania, Rhode Island, Washington and Wisconsin) specify Medicaid as a creditor and establish its standing relative to other claims against the estate, while other states regard Medicaid as a creditor under provisions for reasonable and necessary medical and hospital expenses for the last illness of the decedent.15 Some state laws (e.g., those of Florida and Texas) protect the decedents home by placing certain interests of survivors ahead of the claims of others, including Medicaid.16 Current state-specific data on how these overlapping responsibilities and protections play out in actual practice has not been published. When a sibling, with an equity interest in the home, lived in the home for at least 1 year immediately before the deceased Medicaid recipient was institutionalized and has lawfully resided in the home continuously since the date of the recipient's admission. When an adult child lived in the home for at least 2 years immediately before the deceased Medicaid recipient was institutionalized, has lived there continuously since that time, and can establish to the satisfaction of the State that he or she provided care that may have delayed the recipients admission to the nursing home or other medical institution. In these instances, the designated survivor(s) can inherit the home and other assets to use as they wish. Some states waive recovery altogether, while others reserve the right to recover at a later time -- e.g., when a child attains age 21 or when the sibling or adult child moves out of the home. Although the state Medicaid agency cannot require repayment of a recipients Medicaid expenses during the lifetime of his or her spouse, they may file a claim against the spouses estate at a later date, to the extent of the deceased recipients interest. Some states file a lien against a survivors home to protect the States interest in repayment of the Medicaid recipients expenses after the spouses death. HOW MANY STATES IMPOSE MEDICAID LIENS? Among 46 states reporting to at least one of the three surveys, 18 did not employ Medicaid liens in any context. Eighteen States used pre-death TEFRA liens. Twenty-seven states used post-death liens on probated assets or other kinds of liens in their estate recovery programs. Seventeen states used both TEFRA and estate recovery liens. Since the enactment of OBRA 93, states have implemented liens and estate recoveries with varying degrees of vigor. Many have been wary of the political backlash associated with taking the recipients home and interfering with the traditional strong desire to preserve a legacy for loved ones. However, Medicaid liens and estate recovery programs continue to evolve as states try to cope with growing budget deficits and face the prospect of either raising taxes or shifting money from other Medicaid populations or services, or from other state spending priorities to cover the escalating costs of providing long-term care services. Medicaid is authorized by Title XIX of the Social Security Act. Eligibility is based on section 1902(a)(10), codified at 42 U.S.C. § 1396, accessible at http://www.ssa.gov/OP_Home/ssact/title19/1900.htm. For a comprehensive overview of Medicaid, see Schneider, A. (July 2002). The Medicaid Resource Book. The Kaiser Commission on Medicaid and the Uninsured at: http://www.kff.org/medicaid/2236-index.cfm. Medicaid expenditures in FY 2000 for Medicaid recipients who were not receiving cash assistance as well were $95.2 billion out of the total Medicaid expenditures of $168.3 billion, or 56.6% of the total. Medicaid spent over $43 billion for 2.6 million elderly people not poor enough to receive Supplemental Security Income (SSI) cash assistance payments. Information is derived from the Medicaid Statistical Information System (MSIS) Statistical Tables at: http://www.cms.hhs.gov/medicaid/msis/00total.pdf. The Tax Equity and Fiscal Responsibility Act of 1982 (P.L. 97-248) added liens in Section 1917(a) of the Social Security Act, codified at U.S.C. §1396p. Sections 13611 and 13612 of P.L. 103-66 amended Section 1917 of the Social Security Act related to liens, penalties for uncompensated asset transfer and Medicaid estate recovery at: http://www.ssa.gov/OP_Home/ssact/title19/1917.htm. Centers for Medicare and Medicaid Services (CMS): Estate Recovery Provision at: http://www.cms.hhs.gov/medicaid/estaterec.asp. These are described in Chapter 3, Section 3810 of the State Medicaid Manual at: http://cms.hhs.gov/manuals/pub45/pub_45.asp. The amount that can be recovered is limited to the lesser of two amounts: 1) the amount Medicaid spent on some or all of the recipients medical services and 2) the amount available to be recovered from the estate of the deceased beneficiary. Interpretive guidelines are given in the State Medicaid Manual, Chapter 3. Section 3810: Medicaid Estate Recoveries at: http://cms.hhs.gov/manuals/pub45/pub_45.asp. For example, see Section 0312 of the Rhode Island State Medical Assistance Manual at: http://www.ridhscode.org/0300.htm#_Toc70126145. A third type of Medicaid lien is one that a state may impose against property or assets before the recipient takes possession of it -- for example, money to be paid from personal injury settlements. These liens are beyond the scope of this issue brief. Before TEFRA was enacted, a recipient could give away his or her home without affecting Medicaid eligibility. Subsequent statutory changes (section 303(b) of the Medicare Catastrophic Coverage Act of 1988) mandated eligibility penalties on such transfers. Making a gift of the home may also trigger a prospective penalty: the loss of Medicaid coverage of nursing home care or certain other long-term care benefits for a period of time based on how many months of nursing home care the recipient could have paid for had he or she received full and fair market value for the property. Medicaid rules for determining recipient share of the cost of nursing home care make allowances for the recipients home maintenance expenses. These are time-limited and states may also limit the amounts. Regulations on the recipients post-eligibility share of cost can be found in Title 42 of the Code of Federal Regulations, Chapter 435, Subparts H and I available at: http://www.gpoaccess.gov/cfr/retrieve.html. Federal interpretive guidance is in the State Medicaid Manual, Chapter 3, Sections 3700-3714, 3628.2 and 3590, at: http://www.cms.hhs.gov/manuals/45_smm/sm_03_3_toc.asp. As of 2003, 18 states have adopted the Uniform Probate Code. A typical state example (Montana) is available at: http://www.law.cornell.edu/uniform/probate.html. See Article III. Two surveys that queried states about their Medicaid definition of estate indicated that only seven states consistently regarded both probate and non-probate assets to be available for recovery -- CA, IA, MT, NV, OR, WA, and WI. Data from other states were inconsistent or absent. Sabatino, C.P. and Wood, E. (1996). Medicaid estate recovery: a survey of state programs and practices. AARP Public Policy Institute, Washington. D.C. and Comparing state Medicaid recovery efforts. (1998). North Carolina Long-Term Care Policy Office, available at: http://www.dhhs.state.nc.us/aging/estate.htm#6. State probate laws are available at: http://www.law.cornell.edu/topics/state_statutes3.html#probate. Florida provides broad protection for the homestead against creditors claims. See Article X, Section 4 of the Constitution of the State of Florida at: http://www.flsenate.gov/Statutes/index.cfm?Mode=Constitution&Submenu=3&T.... Texas probate law (section 322 of the Texas Probate Code) protects the homestead from Medicaid claims. See Texas estate recovery guidelines proposed on January 26, 2004 at: http://www.hhsc.state.tx.us/medicaid/EstateRecovery/Framework.html. Nevada Department of Human Resources v. Estate of Ullmer (120 Nev. Adv. Op. No. 16. April 1, 2004) at: http://www.leg.state.nv.us/scd/120NevAdvOpNo16.html. Wisconsin may impose a lien, but release it without collection, if the surviving spouse sells the home (http://www.dhfs.state.wi.us/medicaid1/recpubs/erp/phc13032_2.htm). Nevada courts have affirmed a similar policy, but demanded better clarification on the spouses unimpeded right to sell or otherwise legitimately transfer the home (http://www.elderlawanswers.com/resources/s4/r37053.asp). Advocates in Massachusetts predict devastating effects on use of property by the surviving spouse. See House votes to halt expanded Medicaid collection. Boston Globe, 3/25/04 and Schwartz, R.A. and Sabatino, C.P. Medicaid Estate Recovery Under OBRA 93. Prepared by for the Commission on Legal Problems of the Elderly, American Bar Association, November 1994. State's method of recovering Medicaid costs worries some. Las Vegas Review-Journal, 4/13/04. Sabatino, C.P. and Wood, E. Medicaid estate recovery: a survey of state programs and practices. American Association of Retired Persons, Public Policy Institute, Washington, DC. September 1996; Comparing State Medicaid Recovery Efforts. The North Carolina Long-Term Care Policy Office and Division of Medical Assistance Department of Health and Human Services, October 1998 at: http://www.dhhs.state.nc.us/aging/estate.htm; and Medicaid estate planning and estate recovery in Ohio, August 1999 at: http://jfs.ohio.gov/ohp/bltcf/reports/er/ER_B.pdf.